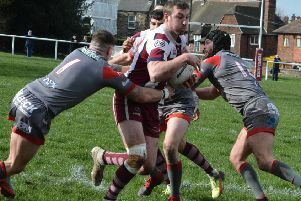 Thornhill Trojans produced a magnificent performance as they stunned Hunslet Club Parkside to win 30-18 in the Coral Challenge Cup last Saturday. Parkside went the entire National Conference season unbeaten last year on their way to winning the Premier Division crown and had warmed up for Thornhill’s visit wioth games against Yorkl City Knights, Featherstone Rovers and Hunslet in the Yorkshire Cup. The conditions favoured good expansive rugby and the opening exchanges saw some good defence on both sides. A terrific Thornhill move saw the ball moved through several sets of hands before Luke Haigh offloaded for Danny Ratcliffe to score between the posts but the referee chalked it off for a forward pass. Another good move again saw Thornhill put the ball along the line and Nick Mitchell touched down in the corner with George Woodcock converting. The large crowd didn’t have to wait long for the next score. Good work from Will and Jack Gledhill saw an neat inside ball to Luke Haigh who managed to evade the chasing defence to score an unconverted try on the left. This seemed to galvanise Hunslet into a quick response. Elusive full-back Craig McShane beating the Trojans defence to score to the right of the posts with Andy Hullock adding the extras. Sven minutes later a floated pass to Hullock saw Ben Shulver ghost through a large hole in the defensive line and he again converted to give Hunslet a 12-10 half-time lead. Thornhill levelled the scores early in the second half through a Woodcock penalty. Thornhill regained the lead after 67 minutes as George Stott crahsed over and Woodcock again converted but Hunslet again hit back with McShane crossing, but Jamie Fields unusually missed the conversion. With the game finely balanced Thornhill applied the finishing touches. From a quick play the ball Ratcliffe dummied and slipped between the centre and scrum half an inside ball found Haigh who offloaded to the supporting Woodcock who crossed between the posts and duly converted. A big shot from George Stott dislodged the ball from the attacker, Stott quickly picking up the ball and passing to Ratcliffe to race 20 metres for a try which Woodcock converted as the Trojans claimed a major scalp and celebrated reaching the second round.